MP-98 POWERBASE : 15V-24V Lithium ION Portable Battery Pack for laptop computers. 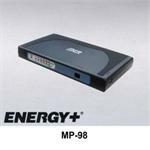 The MP-98 is a long-life rechargeable Li-ION Portable Power pack for Laptop & Notebook computers. Output voltages: 15V, 16V, 18V, 19V, 20V, 24V. Complete Kit Includes: Battery Pack. DC Jack Adapter Cables, DC Output Cable and DC Plugs, Users Manual.